Acabou a “Era Mubarak” no Egito? Life imprisonment of former Egyptian president Hosni Mubarak does not mean that his epoch in the country is over, Mikhail Margelov, the Russian presidential envoy to Africa, said. The Cairo Criminal Court sentenced Mubarak, who ruled Egypt between 1981 and 2001, to life imprisonment on Saturday as he was found guilty of deaths of protesters during an uprising in January of 2011. “The line under Mubarak’s epoch can be more or less drawn after the second round of the presidential election in the country. It will depend on whether this post will be taken by a representative of moderate Islamist politicians or by a descendant of the overthrown power,” Margelov said. The Muslim Brotherhood’s candidate for the Egyptian presidential runoff Mohammed Morsi and Ahmed Shafiq, who was the last prime minister under Mubarak, won most of the votes in the first round of Egypt’s presidential elections on May 23-24 and will face each other in the June 16-17 runoff. Margelov said, however, that the announced sentence for Mubarak means the change of political elites in the country achieved by means of a revolution, adding that this change was necessary as Mubarak’s stay in power had lingered on. Mubarak was overthrown in February 2011 after an 18-day popular uprising. Over 800 people were killed during the revolution, many of them protesters shot dead by security forces. 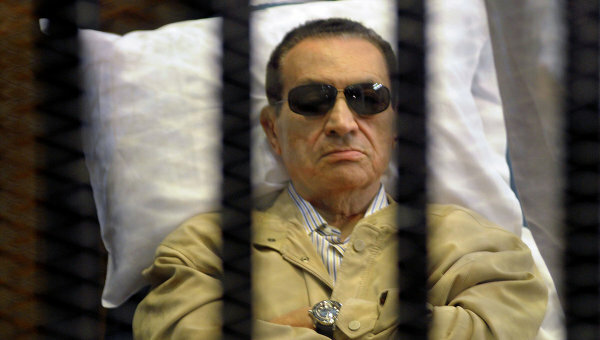 After the sentence was announced, Mubarak, 84, had a nervous breakdown and then suffered a heart attack. Esse post foi publicado em Assuntos Internacionais, O Levante e marcado Egito, eleicoes Egito, Morse, Mubarak, presidente Egito, Shafiq por Joanisval. Guardar link permanente.